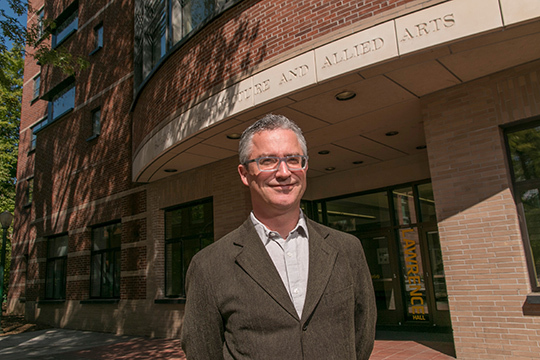 Brook Muller, who has been the acting dean of the School of Architecture and Allied Arts since August 2014, will become interim dean until a national search is conducted to fill the position. Frances Bronet, the school's former dean and acting UO provost, will leave the UO in July and to become provost and senior vice president at the Illinois Institute of Technology. Bronet served as dean from 2005 to 2014. "A&AA is so much the better because of Frances' tenure here; you can see the legacy of her leadership all around," Muller said in an email sent to the school's faculty and staff. "Please join me in thanking her for her dedication to A&AA and to the University of Oregon." Before taking the post as acting dean, Muller was the school’s associate dean for academic affairs. He is an associate professor of architecture, director of the certificate program in ecological design and a core faculty member in the Environmental Studies Program. Interim UO President Scott Coltrane announced May 5 that Bronet was leaving at the end of the academic year. "The loss that Frances' departure represents to the University of Oregon cannot be overstated," Coltrane said. "A tireless advocate for faculty, she has done a fantastic job as provost, leading the charge on our strategic planning efforts, while meeting the day-to-day challenges of the university with passion and professionalism." The timing of the change will coincide with the arrival of the incoming UO President Michael Schill and Coltrane's return to the post of provost. A national search process and timeline for the dean position will be decided by the new UO president and administration later this spring or summer.